Awww... the baby is all grown up now! Yeap, the time has come for the Mint bird to leave the purple nest and fly to its true ancestor, Debian! 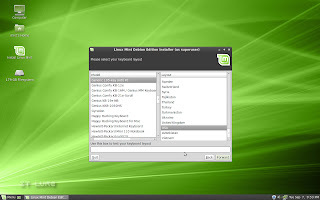 With Ubuntu taken out of the equation, I present you... Linux Mint Debian Edition, recently announced by Clem & Co., an experiment started three years ago that now has a clear future ahead of it. For now, we will have to make do with 32-bit only support and GNOME as the desktop environment. If you want to test it yourself, you should also grab a DVD, as its 875 MBs of data won't be able to squeeze onto a CD. At least there are plenty of mirrors available + a torrent file to make the download as quick as possible. I was expecting an Install only ISO, but the Mint team managed to offer us a Live environment, in which my computer happily booted. 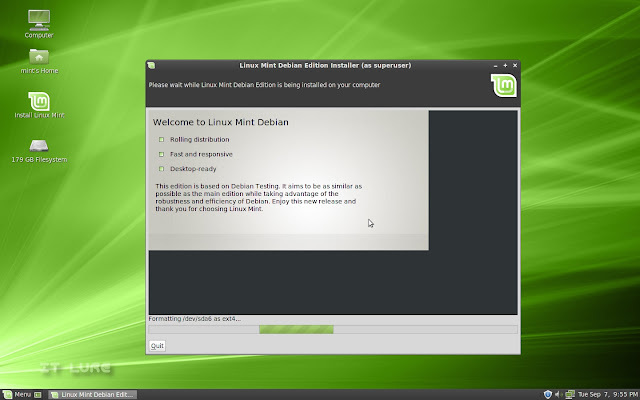 The experience was a smooth one, with no unpleasant surprises, so off I went to the "Install Linux Mint" icon. Here is where the differences start to show. After pressing next on the default English language, I had to select the timezone from this huge list. Goodbye auto-detection, goodbye pretty map... sigh. :D I kid, I kid, it's not that bad, and I'm sure it will improve over time. The HDD-prepare step is also quite different and a bit less user-friendly than Ubuntu's, but still doable even by a less-experienced user. At the user creation window, my machine was assigned a KickAss hostname: ms-7519-desktop. Nice! GRUB was next on the list, after which the review page came along and then it began. The lack of polish is also seen during the actual installation process, as instead of the usual eye-candy slideshow, a single awkwardly positioned short presentation accompany the user. 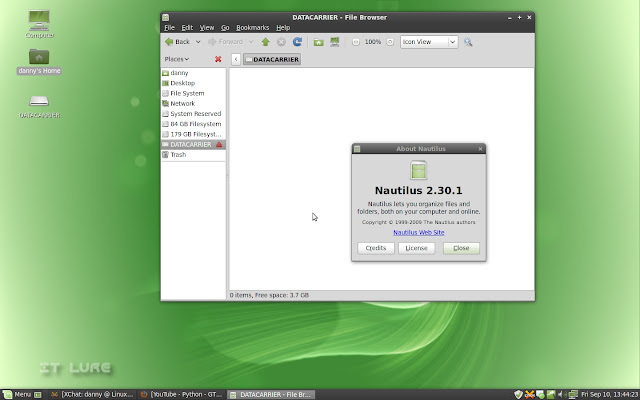 Nevertheless, the distro's main features are efficiently highlighted: "Rolling distribution", "Fast and responsive" and "Desktop-ready". The first one is, in my opinion, also the most important one. Rather than reinstalling a new version every six months, Linux Mint Debian Edition comes to stay on your HDD. New features, patches, fixes and program versions are added to your system through the regular upgrade channel. But, being based on Debian Testing, you should also expect more crashes and errors than usual. But let's get back on track. Where were we? Ah, the installation. It took only a mere 10 minutes to complete, without any incidents on the way. So, a restart and a textful, imageless boot sequence later, I was inside LMDE. 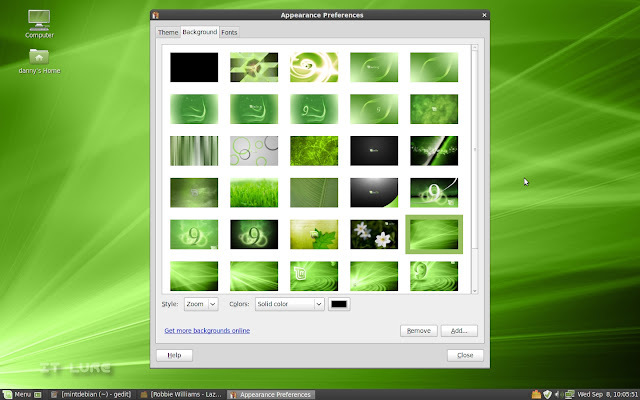 With the same theme and the same layout, it's like looking at the exact copy of Linux Mint that was released a while back under the Ubuntu umbrella (damn you Rihanna!! I cannot see or hear this word without the cursed "ella, ella e e" echoing in my head each and every time). There is a nice selection of wallpapers and themes in case you get bored with the default ones, but still are lazy enough to not open Gnome-look and hunt for others. Yay! The famous Mint Main Menu is, of course, on-duty and ready to serve you with the generous software selection offered by the distribution. From here you can add your favorite applications to, well, the "Favorites" section, you can uninstall programs or even add them to the startup sequence, so they'll be up and running each time you power up your computer. Piece of cake (which, I am happy to inform, is NOT a lie)! And let's not forget, if you type in the name of a program that is not yet installed, you will be offered the option to either search the repositories for it or install it straight away if you got the name exactly right. 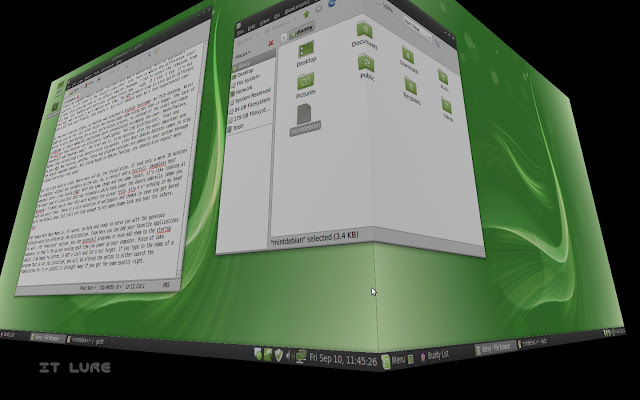 Even though Mint now received extra geek points for being built directly on top of Debian, it doesn't mean you can't still brag around with wobbly windows, cubes and whatnot. Unfortunately, it isn't as easy as it used to be. First of all, there's no "Hardware Drivers" app anymore, so you will have to grab your gear and go hunting for your proprietary GPU drivers in the deep, dark forests of... SYNAPTIC! Or you can choose the Software Manager. Whatever tickles your fancy, really. Me, having a current NVIDIA card, I just installed the nvidia-glx package, along with nvidia-settings and nvidia-xconfig. If you have older chipsets, you will most likely have to go with the 173xx legacy driver. Once the installation is complete, there is one more step to perform: open a terminal and type 'sudo nvidia-xconfig' and Mint will take care of writing the new configuration file so you can enjoy the benefits of the proprietary driver. You will then restart your machine and observe that there's nothing really Compizish about your desktop, so you will pop open the Appearance window and notice, in despair, the lack of a "Visual Effects" tab. OMGOMGOMG, what do I do noooooooow? Fret not, my dear reader, as the luxuriant jungle of Synaptic (yes, there is also a Synaptic jungle) holds the answers to your prayers once again. Of course, you could use the 'compiz --replace &' command, but why not explore other possibilities too? So, pop up the software manager, search for fusion icon and install that sucker. It will then appear in your notification area of your taskbar. 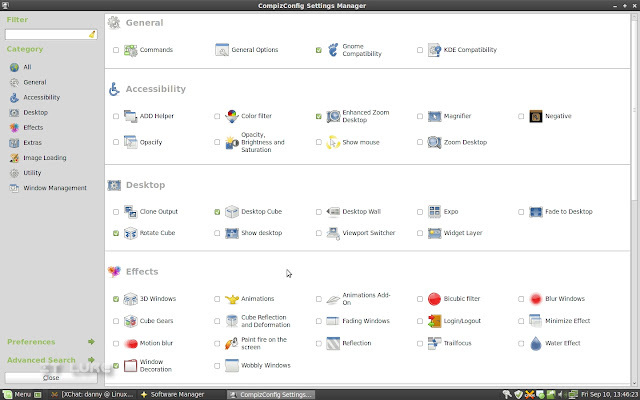 Right click, point to "Select Window Manager" and select "Compiz". Then open up a window and start freaking out because your window misses one important element: the TITLE BAR! AAAAAAAAAAA. Take a deep breath and right click on the fusion icon again and go to "Settings Manager" where you will put a checkmark next to "Window Decoration". YAAAAAAAY, you can has title bar agaaaain! But wait, why can't I move it around? WHYYYYYY? Because there's another checkmark missing in front of the "Move Window" button, duh. 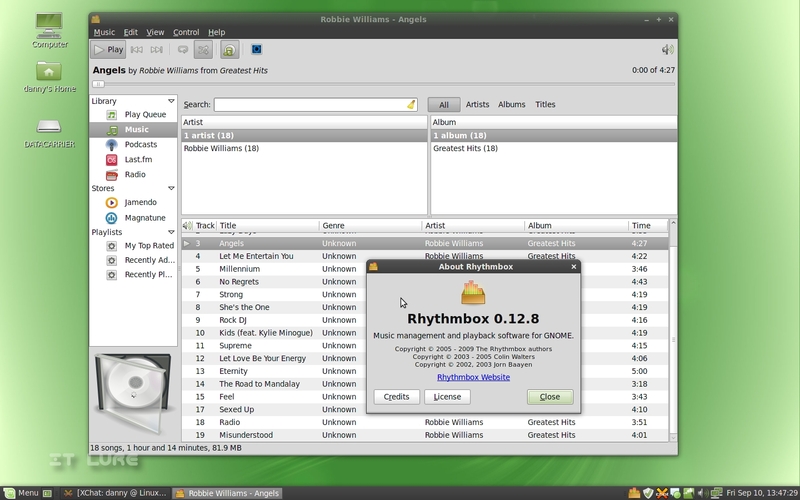 :) Furthermore, check the "Resize Window" and "Application Switcher" boxes. So, once you can perform at a normal level again, you can start messing around with wobbly effects, rain, cubes and other shenanigans (for added fun, install the "compiz-fusion-plugins-main" and "compiz-fusion-plugins-extra" packages). There is quite a large update pile waiting for you once LMDE is installed, and you should expect to receive updates more often than the Ubuntu based Mint. On top of that, every once in a while, something will break, but, almost everytime, Synaptic instructs you on how to fix the problems, usually by running a command in the terminal. As far as the included software bundle goes, there's nothing really to tell the Main and Debian editions apart: Firefox with Flash included, Pidgin, Rhythmbox, VLC, GIMP, OpenOffice, XChat, Transmission, etc. Of course, the LMDE will always have the latest versions of said applications. Oh, if you encounter any kind of problem, just pop open XChat and you will be automatically connected to the Mint Chat and Mint Help channels, where there is almost always someone willing to help. If you have Windows partitions on your HDD, they are easily mounted and written to from within Nautilus, the file manager. You just have to provide your password and you're done. Hardware-wise, the HP Deskjet 3940 printer works as good as it can in Linux (I really should be getting a new printer - the difference between Windows and Linux performance is just ridiculous). USB drives are auto-mounted in a few seconds and my Edimax USB wireless receiver works like a charm. The Samson C03U USB condenser microphone was also ready for recording at once. There seems to be a problem with the time, as even though I selected the correct timezone, the clock is three hours forward. And if I correct it, it messes up the time in Windows, and fixing the time in Windows will break the time in Mint and so on. :D Bah, time is a lie anyway, so who needs it? Another pet peeve is the way the fonts look on screen. Even though I installed the Microsoft fonts (and that made webpages look a bit better) and adjusted the hinting, there's still something wrong with their consistency. It's a pleasure to look at text in Ubuntu and Ubuntu-based distros so, if you figured out what Canonical's secret is, please share. Certainly! Though a beginner might want to have a helping hand from a more experienced user during the installation process of the system itself and the proprietary drivers, once that's out of the way, it's pretty much the same smooth experience as it is with the main edition. That is if you're luckier than I was with the sound server. The developers did warn that there are some rough edges to be expected and indeed they are. But, considering the fact that this is the first version of the Debian edition, the quality of this OS can only go up from this point, so, needless to say, I have high expectations for the future development of this experiment. If you like keeping your favorite applications up to date at all times, or if you simply hold a silly grudge against Ubuntu, go grab LMDE. Enjoy! 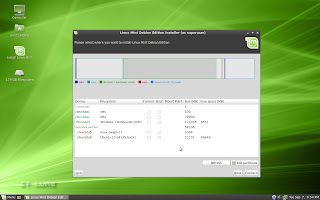 Download Linux Mint Debian Edition here! Thanks for the helpful review. I downloaded the ISO and have been thinking about installing it. The main issue I ran into was the partition manager in the installer. I'm a pretty experienced Linux user, but have never used Debian and can't figure out how to wipe and use the entire hard drive. 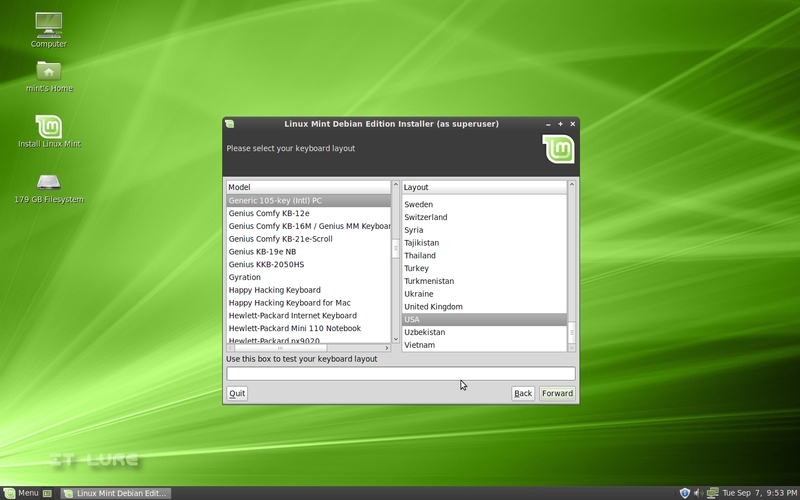 or if you simply find that Debian is a superior distro than ubuntu, this is an excellent option. Not all people who prefer debian do so because they don't like ubuntu, or even care about ubuntu for that matter. For some of us, it's just all about debian. I for one have been using debian as a server and a desktop before there ever was an ubuntu. Imagine that. I missed the gnome-language-selector from Ubuntu/Mint. Also need to install ttf-sazanami-mincho and ttf-sazanami-gothic to enable japanese text in the browser. Other than that, LMDE is a very nice distro indeed. For KDE based I can always go to Mepis, but for Gnome, LMDE is my choice now. Congrats to Clem & team. Could you explain in details how you enabled compiz? I have problems with making it work (actually nothing works, except for shadow around the windows), and everything worked fine on main Mint version, as well as Mandriva Gnome I have installed on another partition. I installed a few packages from Synaptic and got all those options in Compiz settings, but nothing helps. 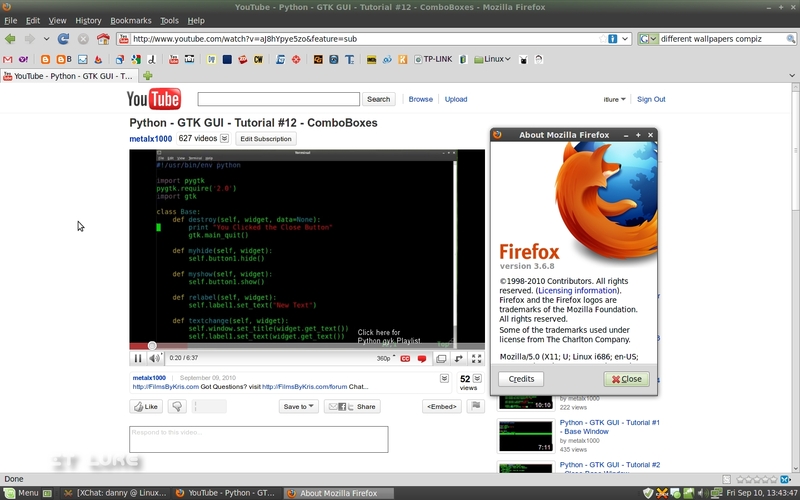 "Xlib: extension "GLX" missing on display ":0.0". I got an old Radeon 9550, with no proprietary drivers, and as I said, compiz worked fine on other distros. I'd guess it has something to do with the drivers. I have performed only the steps described in the article: install Nvidia drivers, type the "nvidia-xconfig" in the terminal, reboot the machine, install compiz-fusion icon, choose Compiz as the window manager, and then enable the needed options in CompizConfig. Try searching for radeon drivers in Synaptic, see if you can find something there. I Definitely don't like the 175MB of extra size that the Debian edition brings with it. It appears this has something to do with language support, according to the release notes? Why such a huge difference? On another note, I would really like to see a minimal Openbox edition as well as a KDE edition - CD size please! Just one question before I bother to install this Mint Devian animal. Is it as fast, as easy to install and use and as stable as classic Mint in its various flavours? For fixing time issue, ntp might be the answer though i don't know if it's gnome/kde centric or standalone app. In that case, it might bring in the dependent libraries as well. However once installed it automatically sets the time and you don't have to worry afterwards. @Barista Uno - It's definitely faster, install wise slightly different, though easy and yes, it is quite stable as well, atleast i found it to be. You must realize that this is only a pet project for the Mint team. 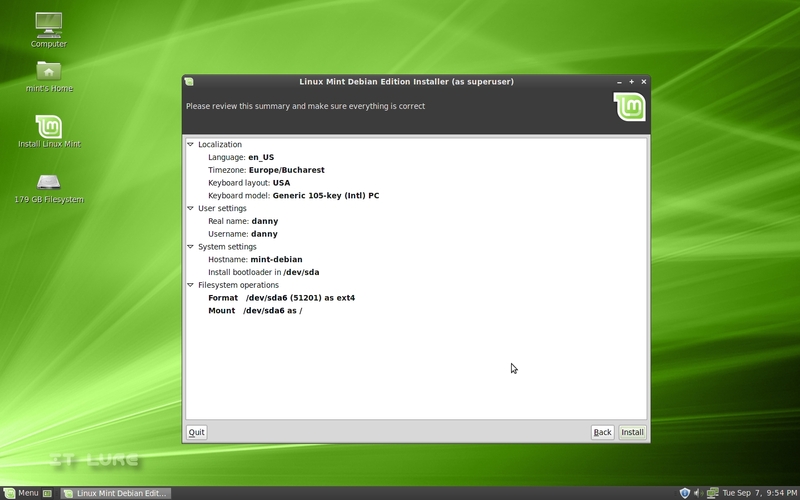 There are no plans to leave the Ubuntu base that is used for LinuxMint. That being said this is a very nice pet project. The only thing that I really didn't like is the same for all of the Mint systems and that is the poor security you get by using their unsigned packages and repositories. To fix your time issues, as root edit /etc/adjtime, I guess it will contain UTC, change this to LOCAL (or the other way). Hope it helps. Barista Uno, it is indeed faster, but as Anonymous said, the installation is a tad harder than on the regular Mints. There is one more problem though, which, by the way, was not mentioned in the article - maybe I should update it... -: you cannot install .deb packages with a simple double click. You either have to go to the terminal and dpkg -i packagename.deb or, the obvious long-term solution is to install the gdebi package. Unfortunately, that is not so obvious for beginners, and they will end up scavenging the forums for solutions. I'm sure that the next release of the Debian Edition will have at least this issue resolved. I love the fact that Mint now has a rolling release. I just wish it fit on a CD and that my wifi worked on my notebook. Danny, Thank you for the comment on installing the gdebi package. This is now making my experience of using Mint-Debian more enjoyable. Also, when I first used VLC I thought the sound did not work from VLC but I was using Firefox/Youtube at the same time with sound. Turns out like you - only one sound output application at a time. Thanks for your help Danny. Your instructions regarding NVIDIA card and Compiz worked for me at no time. Now, about the installation process, it is easier that is said. Me, personally, i use to prepare the partitions with Gparted and then run the install. Thus, i had only to 'tell' the installer where to place /root and /home. PS: glad to see that minitube plays flawlessly out of the box! Thanks for mentioning the 'sound' issue -- I couldn't figure out why my sound was working in some apps, but not others! Do we know if this is a 'Debian' issue, or a 'Mint Debian' one? Do we know if the right people are aware of it and trying to fix it? @Dare: If you wanna know for sure, simply report it to the Mint developers. The response is "I heard about this in the comment section and this is something we’re looking into. My intuition is that it’s something to do with Flash and PulseAudio. We’ll have this figured out soon." To Danny and others who responded to my question - thank you. Instead of Chakra, go Arch Linux. The setup time is worth it. Pardus is quite a good distro, sorta bloated though, and not always that stable. Same goes for PCLOS. Ubuntu is basically the Linux version of Windows, why bother? "Ubuntu is basically the Linux version of Windows, why bother?" Can you back that comment up? Simply because it's the most popular distro doesn't justify calling it the "linux version of windows". It's still very much linux and it still works very well. If by "Linux version of windows" you mean "works out the box" then I can't disagree with that. It's getting harder and harder to find a Blog comments section that isn't invaded by an Arch fanboy these days. Please. It's no faster than a minimal Debian/Ubuntu install, AUR package quality is a joke (Cairo-AwesomeWM breakage, anyone? ), and it's fanboys think they're geniuses just because they followed the beginner wiki to a tee. I'd take Sid, BSD or Sorcerer over Arch any day of the week. Just two cents here... LMDE is also great for some reasons NOT mentioned anywhere here, it is low on resources - way lower than the main mint edition. It is also more responsive - probably as a consequence of less Ram, and perhaps less packages, daemons, etc. But if you can get past the annoyances and config it as you need, it's a nice running Debian desktop. 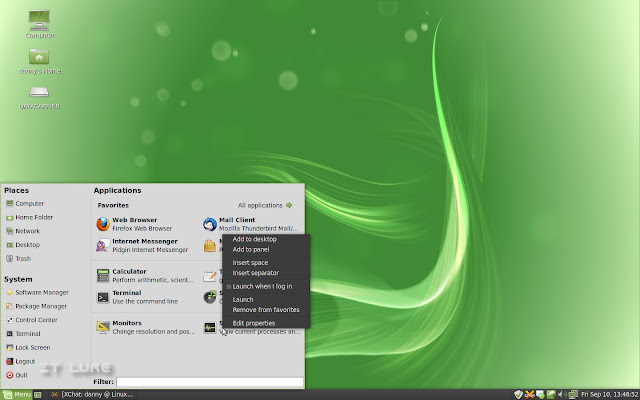 An alternive, if you like Debian Squeeze custom DT's is to consider Crunchbang Linux. They have an alpha out now (what I'm typing from) and it is wonderful. A different breed than LMDE, but it offers a scaled down yet fully functioning Debian Squeeze DT. Thanks so much. You seem to know just how i felt... as long as i can get compiz/etc "back" to the way it was in ubuntu based linux, i am good to go.... and excited about lmde. Glad to have been helpful! Have installed in on Lenovo s10e netbook. 2 restart the install and then carry on ignoring the swap partition for it to work. 3 need to load swap partition after install. Thanks for the review. LMDE is working quite well. I have installed the NVidia drivers and got the Compiz working without any trouble using your review. I have one proposal for the Linux community. I would like you all developers of all flavours of Linux to not to compare the Linux Os with MS Windows. They shouldn't state that this OS is a "replacement" of MS Windows. All developers of Linux based OSs should introduce their own Linux OS as operating system by itself, and there should NOT be a mention of MS Windows. Here is a good stable OS, in which you'd find everything necessary for day-to-day use of a computer by an ordinary person, so use it and it is free. Sometimes, we need MS windows as some had not made programs that works in a Linux based OS, but we must NOT put special attitude for MS Windows, that we must install MS Windows first and then a Linux OS. There should NOT be the "1st" basis for MS Windows. There should be the "1st" basis for Linux OS. 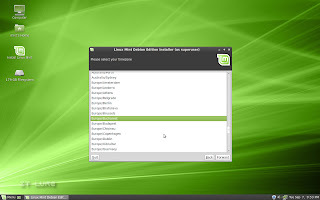 Linux OS must be the 1st OS and any other OS could be the 2nd OS. Linux OS should not be the "replacement" for MS Windows. That is NOT Linux OS legacy! Thank you, thank you. I was going to give up on LMDE because it's silly not to have wobbly windows in 2012. Worked a treat!